60 | TH E M R EP O RT O R I G I NAT I O N S E R V I C I N G A NA LY T I C S S E C O N DA R Y M A R K E T SECONDARY MARKET THE LATEST SECONDARY MARKET Fannie Mae's Net Income Reaches $2 Billion in Q3 Though Fannie Mae was profitable in Q3, the Enterprise's net income and comprehensive income both declined by more than 50 percent from the previous quarter. I n November, Fannie Mae reported a net income of $2 billion for the third quarter and a comprehensive income of $2.2 billion. Though Fannie Mae was profitable in Q 3, the Enterprise's net income and comprehensive income both declined by more than 50 percent from the previ - ous quarter when it reported totals of $4.6 billion and $4.4 billion, respectively. The decline in net income was primarily due to fair value losses, which were partially offset by credit-related income, according to Fannie Mae's announcement. 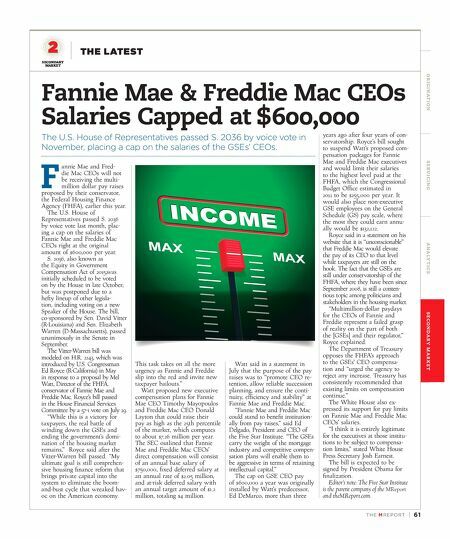 "I am proud of Fannie Mae's leadership in bringing positive change to the housing finance system," said Timothy J. Mayopoulos, President and CEO of Fannie Mae. "We are delivering innovative technology to lenders to help them originate loans with greater certainty and efficiency, while we continue to transfer a significant amount of credit risk to private capital to better protect taxpayers. Our strong financial results punctuate the ongoing improvements we have made to give our partners the clarity they need to lend with confidence and help more families get a mortgage they can afford." Fannie Mae reported a net worth of $4 billion for the third quarter, which will result in a dividend payment to the Department of Treasury of $2.2 billion in Q 4 (Fannie Mae paid $4.4 billion in dividends to Treasury in Q 3). For the period of September 2008 through the end of Q 3 (September 30, 2015), Fannie Mae has paid $142.5 bil - lion in dividends to Treasury— more than $26 billion more than Fannie Mae received from taxpayers in the 2008 bailout ($116.1 billion). 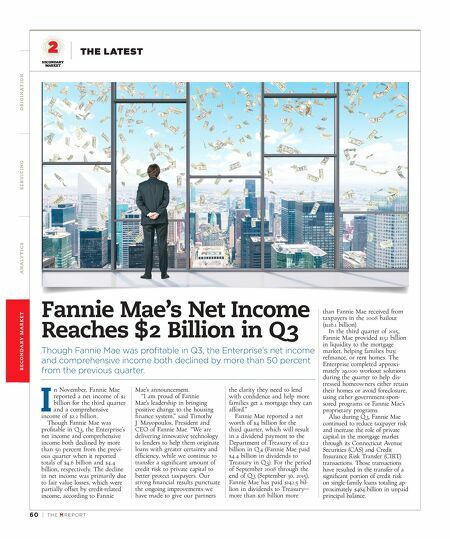 In the third quarter of 2015, Fannie Mae provided $132 billion in liquidity to the mortgage market, helping families buy, refinance, or rent homes. The Enterprise completed approxi - mately 29,000 workout solutions during the quarter to help dis- tressed homeowners either retain their homes or avoid foreclosure, using either government-spon- sored programs or Fannie Mae's proprietary programs. Also during Q 3, Fannie Mae continued to reduce taxpayer risk and increase the role of private capital in the mortgage market through its Connecticut Avenue Securities (CAS) and Credit Insurance Risk Transfer (CIRT) transactions. Those transactions have resulted in the transfer of a significant portion of credit risk on single-family loans totaling ap - proximately $464 billion in unpaid principal balance.